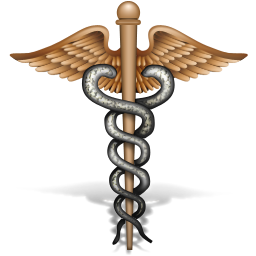 A great new way to provide paramedics and the emergency services with your vital personal and medical information. By using the latest technology the emergency services can get all your details sent directly to their mobile phone. If you are involved in an accident or a medical emergency, the emergency services can send a text message on their mobile phone quoting your unique IceText membership number. Within seconds, they will receive a text message back to their phone giving them a summary of your most important information. They are also sent a link to a special 'mobile optimised' web page. This private and secure web page gives them much more information about you. The emergency service person can click this link to be taken directly to a page on their mobile phone which gives them access to your vital information. The emergency services can access all the life saving information that you have provided, allowing them to understand your needs and requirements and enabling them to make better decisions about your care and treatment when it really matters. If you are taken to hospital the first responder can 'forward' the messages to the hospital staff so they can be famililar with all your emergency details in advance of your arrival. A great new way to provide paramedics and the emergency services with your vital personal and medical information. By using the latest technology the emergency services can get all your details sent directly to their mobile phone. 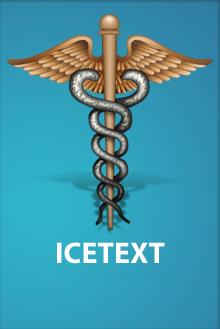 If you are involved in an accident or a medical emergency, the emergency services can send a text message on their mobile phone quoting your unique IceText subscription number. Within seconds, they will receive a text message back to their phone giving them a summary of your most important information. They are also sent a second message containing a link to a special 'mobile optimised' web page. This private and secure web page gives them much more information about you. The emergency service person can click this link to be taken directly to a page on their mobile phone which gives them access to your vital information. The emergency services can access all the life saving information that you have provided, allowing them to understand your needs and requirements and enabling them to make better decisions about your care and treatment when it really matters. If you are taken to hospital the first responder can 'forward' the messages to the mobile phone of the emergency hospital staff before you arrive meaning that the hospital staff can be famililar with all your emergency details in advance of your arrival. You get a 12 month subscription to the IceText messenging service. You can enter all your details into our site to setup your subscription. We send you a letter with an IceText ID Card for you to carry with you and to explain how to manage your information. You get 6 emergency incident credits as part of your subscription and you easily top up your account with our text message bundles. 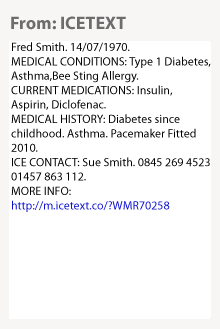 You can engrave your IceText details onto a wide range of medical ID products (available at extra cost). Your information with us is fully protected and stored on our secure servers. We never divulge your information to anyone. 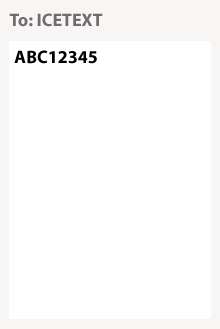 Your membership number also contains three random letters in addition to your unique number to make it secure. Yes! As part of your membership we provide you with a dedicated website that you can visit to change your information at any time. Changes made to your information are instant so they are instanly available if they are needed. ICEText is part of The ID Band Company. 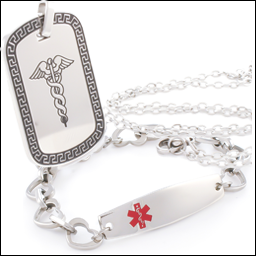 We have the largest range of medical ID jewellery in the country so we are sure to have something you would like. We can engrave your details, your ICEText membership number and the number to text onto a huge range of great value medical ID jewellery. 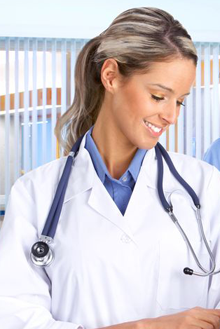 Whether you are looking for Medical ID products, Sports ID or Childrens ID, we have a massive range of Medical Alert items including Medical Jewellery, Medical Bracelets and Medical Tags. Whatever your requirements, we are sure to have a great ID product. Copyright © 2012 The ID Band Company Limited. All rights reserved.